One of the most magical experiences anyone can have in life is a dolphin encounter. 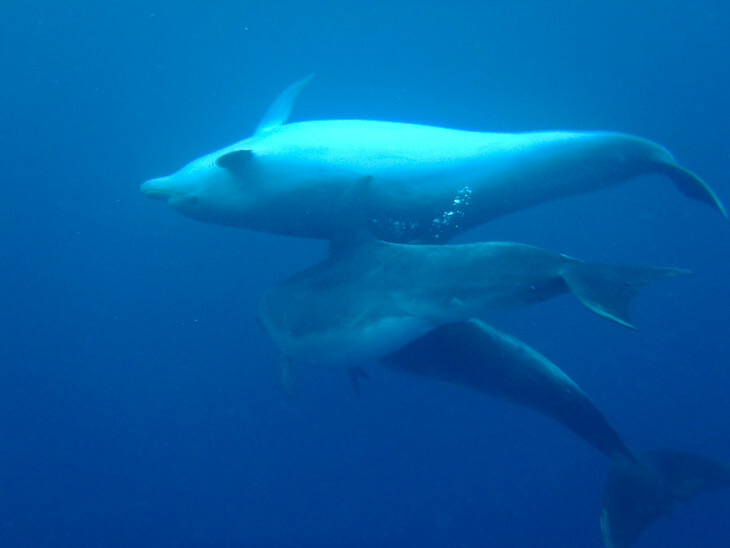 These intelligent and playful mammals are one of the most extraordinary creatures in the ocean that anyone could have the opportunity to interact with. New Zealand has very strict standards when swimming with dolphins and we felt very comfortable jumping in the water with Fuller's Great Sights in the Bay of Islands. Why is New Zealand a dolphin encounter in New Zealand is more environmentally friendly than other countries. They cannot feed the dolphins to entice them to come back day after day. Only 3 vessels are allowed within 300 metres of the dolphins at one time. As our Captain Billy said, the dolphins come up to the boat for a visit because they want to, if we fed them, we would never know if they are here just for food or if they want to be here to interact. Our guide Floppy has been studying dolphins and having dolphin encounters for 18 years. She knows what she is doing. When radioing to the other vessels to discuss whether they would stay with a pod or move on, she and Billy chose to move on. 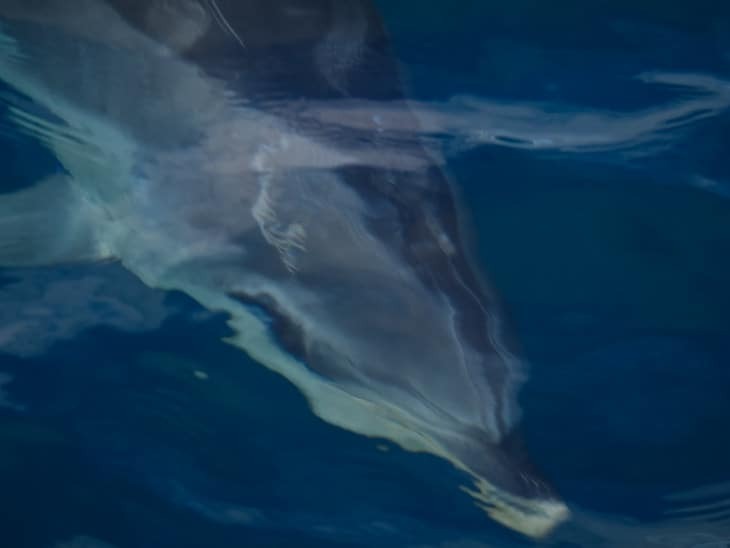 They know the dolphins well from their various markings and scars and knew that the group the other two boats were following weren’t filled with the most interactive of dolphins. Floppy and Billy are the most experienced guides on the bay and we felt incredibly lucky to have them as our guides. They are patient and knowledgeable and they gave us the best experience that we could possibly have. We heard the other boats struggling through the radio chatter and knew that we were on the right boat with Fuller's Great Sights which the Flying Kiwi Booked through Awesome New Zealand. Our boat moved to the other side of the bay away from the bigger vessels and found the most playful dolphins to have a dolphin encounter with. They called these two dolphins The Midgets. They are a couple of smaller male dolphins with another fun dolphin (that unfortunately I can’t remember the name of) along with a fourth dolphin that didn’t have a name. He was as equally curious as the rest of them. We were lucky to have the friendly pod to ourselves before any of the other boats made their way to our side of the bay. Floppy studied the dolphins before allowing us in the water. She made sure that there were no babies in the group and that these dolphins would indeed stick around for a bit to let us play. Once she decided that we could go in, there was no room for hesitation. She and Billy yelled at us to get in now! They said, stop thinking about the cold. We didn’t have wetsuits and that water looked pretty cold and dark to me. Dave was the first in of the group as he is a fish at heart, and went straight to the pod where he had the most amazing dolphin encounter of his life. He played with them for a good 20 minutes never leaving their side. Note: We never touch the dolphins. Dolphins gain your trust when you keep your hands at your side. We were instructed to never reach out and try to pet them. They will swim away if they feel threatened. But if you keep your hands to yourself, they will swim around and around you coming closer and closer. You may have the urge to reach out, but don’t. I was slower getting in the water than Dave, the cold took my breath away and I panicked a little bit. I swam back to the swim platform and Billy and Floppy seemed disgusted with me. I gave myself a good scolding and jumped back in. It wasn’t long before a dolphin came right up to me to check me out. It swam around a bit and I could see its eye looking right at me. We were told to sing and do some twirls to attract the dolphins. I didn’t do much, I simply swam and floated getting my fill of dolphin fun. Dave, however, was a different story. 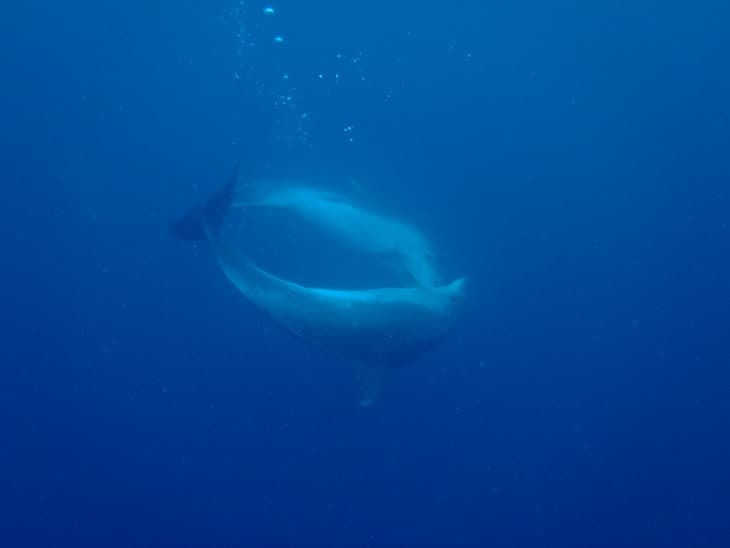 He was determined to get the best photographs and video and sang his heart out while diving, spinning and turning upside down. It worked because the dolphins loved him. I heard their yells from the boat trying to get the rest of us to go to the right direction of the trio of dolphins. Lucky for us, a fourth dolphin was swimming around and coming by to visit the rest of us that weren’t quite as on the ball as Dave. Sure enough he told me he did! Click on the video above to hear Dave's rendition of the A-Team. The dolphin seemed to like it because it squealed right back at him! Looking for another dolphin encounter? See our South Africa dolphin swim in great white shark country. He had some incredible views and witnessed the most amazing moments. I am going to hand the computer over to him now so he can share his dolphin encounter. I could feel the dolphins looking at me. They were as curious about me as I was of them. At one point it circled around me so much that I ended up spinning to the point where I got dizzy. Floppy and Billy said that the dolphins love doing that to people.“They’re taking the piss out of you” they said. Two dolphins circled below me at one point and looked like they were kissing each other as they spiraled down. I thought I had my camera on record, but didn’t and cursed myself. On the other hand, I witnessed an awesome moment. Another time the dolphins swam by belly to belly. One was upside down and the other swam above it in perfect unison. There is nothing like that feeling when a dolphin looks directly in your eyes and starts clicking. You feel like they are communicating with you on some higher level that you don’t quite understand. As Floppy said, Dolphins can read you from the inside out. They can feel your heartbeat and whole being, and I felt that way too. It was the most incredible experience of my life and I just skydived a day earlier! 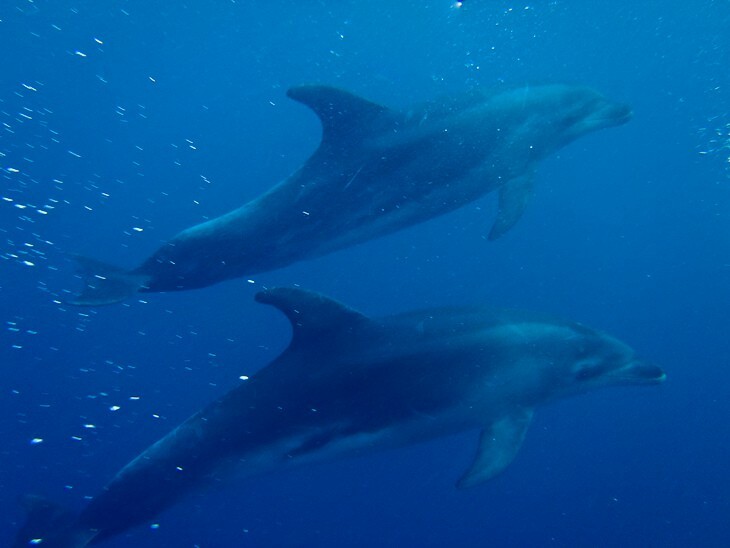 To find out more about how you can swim with the dolphins check out Dolphin Cruises in the Bay of Islands on the North Island of New Zealand. Costs start at 89 NZ dollars for the dolphin view and add $30 NZD to swim with the dolphins. 51 Responses to "A Dolphin Encounter in New Zealand"
Might swimming with dolphins make you a target for sharks? The photos and videos are great! I was particularly impressed with the tour operator’s awareness of how to spend time with wild dolphins without causing them harm. I wish more places would adopt guidelines like that. Thanks for sharing your experience! I agree Wherethedolphinsswim. Too many tour companies only care about making the customer happy. And too many tourists don’t care enough to travel responsibly. If people would stop doing the dolphin swims with the places that have dolphins penned in, it would put those companies out of business and the wild dolphin experience would thrive. I love how they deal with wildlife in New Zealand. We were told not to touch the dolphin and to let them come to us. They are intelligent creatures and they will come up to you to have a look if they feel safe. What a truly magical and incredible experience this must have been. I LOVE the pic of the dolphin, just below your first video, for it looks like a painting…truly incredible coverage of your day with the dolphins. Thanks Jeff, swimming with the dolphins in New Zealand really was a highlight. Most people do it on the South Island, but up here it was amazing. The dolphins are a different breed so there are less of them, but you don’t have to wear a wet suit. Being with them without the barrier was truly spectacular. Thanks Shannon, New Zealand has been quite the adventure. I know that there are other places in the world that take proper care of the dolphins too. 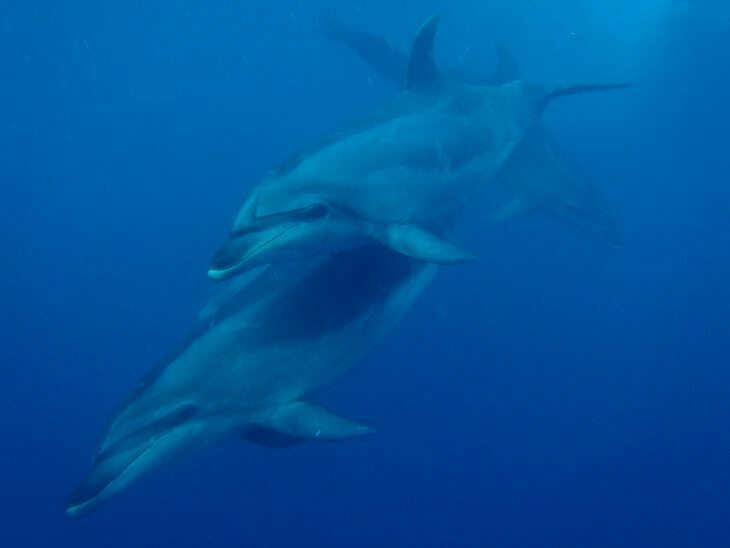 We had a wonderful experience in Honduras swimming with wild dolphins. I hope that the countries that are doing it start to realize that you can offer a dolphin swim without having to disturb their natural habitat. I would love to swim with dolphins. So beautiful! Looks like you had an amazing time! Thanks for sharing these fantastic pictures and the videos. I once swam with Dolphins in Cuba, it was pretty exciting! In New Zealand you may also encounter dolphins in Curio Bay. Apparently they often play in the surf next to the surfers! What an incredible experience! The video where you can hear them chirping is pretty amazing, it made me feel like I was there! This is going on my bucket list! Thanks Annie. It was pretty amazing that he got the chirping on film. There is nothing like hearing their clicks underwater. They are definitely trying to communicate. At least that is how we felt. Anyway, this looks like it was an extraordinary adventure! I will be doing this someday. Debbie, I hope that you get to do it someday. Funny you should mention Flipper, there was a town that we stopped at where there is a statue of a dolphin that lived in the bay and let kids ride on it in the 1950’s. I totally thought of Flipper and thought that maybe this dolphin inspired the TV Series. How fun!! I would have loved to try this in NZ, but I only went on dolphin-watching tours in the middle of winter. I definitely wouldn’t have wanted to dive in at that time of year! Looks like so much fun, though. I love how playful and agile dolphins are. Amanda, I hear you, I wouldn’t want to swim with them in the winter. When the weather gets colder they do offer wet suits to swim in. The water wasn’t too bad once we got in. Gotta say Dave, you got quite a show tune. 🙂 My kids gave 2 thumbs up. What an amazing experience!!! It’s good to know the research you guys put into choosing them. Thanks for the thumbs up from your kids. Dave has been working on his vocal chords for a little while for his big debut. Christy you are very lucky to swim with them regularly. They are extraordinary. I have goosebumps! Wow, what an extraordinary experience!!! Must do this 1 day! Yes, you will totally have to do it one day Andi. 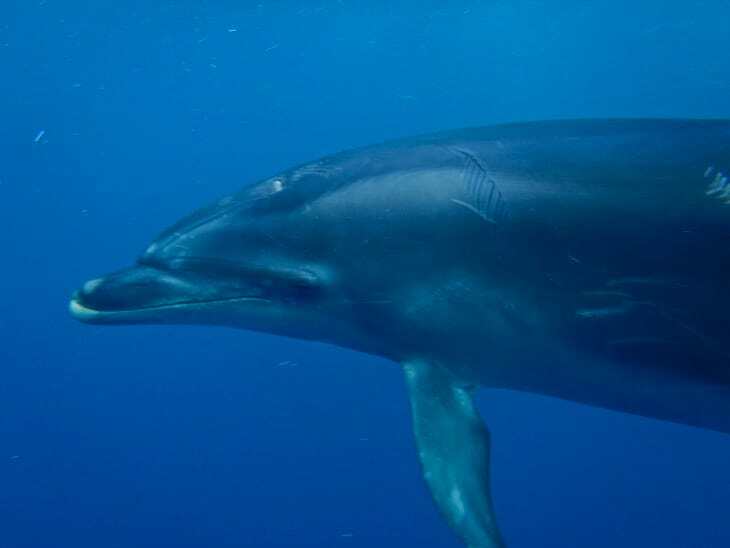 We swam with dolphins once before in Honduras. 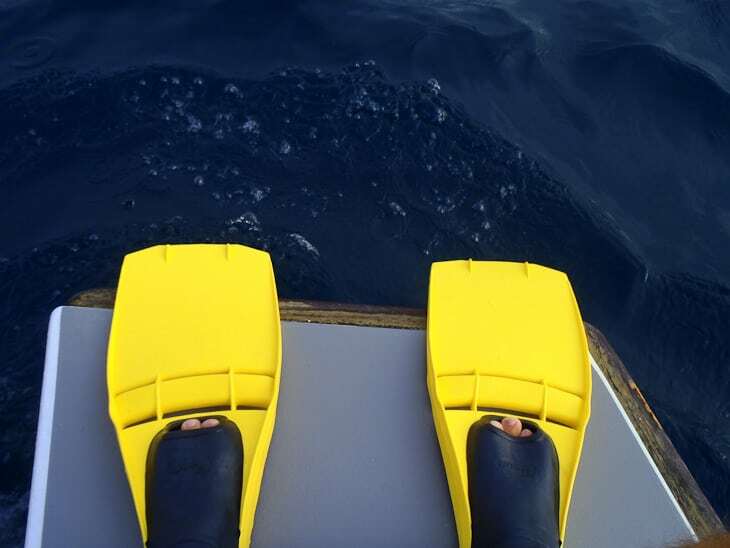 It was between dives and our captain spotted a pod. He told us to get in the water with them and it was amazing. It was a spontaneous moment and they were wild dolphins that weren’t being fed or anything. They were just happy to check us out for a little bit and say hi. What a beautiful adventure it must have been. I’m so jealous, guys! Glad to hear that proper care is taken so that tourism and wildlife can coexist peacefully. It is great to see people taking proper care when it comes to wildlife protection. I have no desire to swim with dolphins in a pen like so many places in the Caribbean. New Zealand is doing it right. Wow, what an incredible adventure, guys. I just love dolphins. I have seen a lot of them when I was working on the ships, but I have never swum with them. You guys are very lucky to find such a good guides. So great to hear that the well-being of the dolphins was most important to them. Wow, what a great experience that must have been! So jealous…I think I would have had a hard time jumping into the freezing water too! I’m a big wuss when it comes to cold water, but I think even I would get over it to have that experience. I am a wuss to David, but I had to get over it too. At first it was chilly, but surprisingly not so bad once you were in. The water ended up actually being warmer than the air. Awww. I’m jealous! Sounds like you had a lot of fun Dave and Deb. I really keep wondering what went on in the minds of the dolphins when Dave was doing everything to catch their attention. Lol. Nobody knows… hahaha. They really are such sociable creatures, aren’t they? Imagine, they could come THAT close to humans without having to be fed as a “reward”. A really cool experience for you guys! Hi Marcello. So true eh. I am sure that they completely think we’re ridiculous and funny and love every minute of it.